Linoleum: It may surprise you to learn that some exciting things are going on in the world of linoleum. Marmoleum, an all-natural, eco-friendly version of linoleum, is becoming increasingly popular. It comes in over 100 colors and can be cut into shapes to create your own custom pattern for your flooring. It lets you create the look of ceramic tile with a warmer, softer, less expensive material. Cork Flooring: Another exciting eco-friendly product is cork flooring. Cork comes from a natural, sustainable source, and this flooring is often made from recycled wine corks. We carry products from several different manufacturers. Commercial Flooring: If you own a commercial property, you need specialty flooring that can stand up to heavy traffic without losing its beauty and appeal. 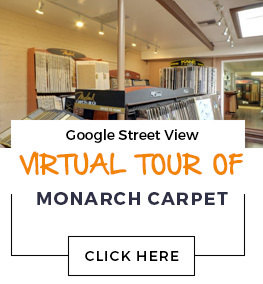 At Monarch Carpet, Drapery & Upholstery, we have plenty of options to choose from. Our expert staff can help steer you towards materials that are appropriate for your specific business needs and budget.